When you visit the old mill area in Oregon City, it’s fun to speculate on its past and its future. Less appealing is the present. In its current state it’s derelict, a mess of vacant industrial buildings with rusted, soot-streaked facades and broken windows. Chimney vents sit lifelessly on roofs, no breath expelled. All around it’s still and quiet, except for the nearby whoosh of Willamette Falls. Any visitor to the falls would be forgiven for not recognizing it as the natural wonder it is. Its very proximity to the mill buildings suggests some sort of man made damming system, constructed to power industry. But actually, a series of mills were purposely built on that spot to take advantage of the natural hydropower. Willamette Falls, at 1500 feet wide and 40 feet high, is the largest waterfall in the Pacific Northwest and the second most powerful waterfall in the US, behind Niagara. It’s horseshoe shaped and wildly cascading, as beautiful and sublime as any other falls. So why is it so overlooked? Well, because all those industrial buildings have blocked public access for aeons. As is the case with many things before white settlers exploited them, Willamette falls was once the terrain of Native Americans. Several local tribes built villages and fished for salmon there. Then 1844 saw the first flour mill, 1857 the first Woolen mill, and 1866 the first paper mill. In 1888 The Willamette Falls Electric Company—later renamed Portland General Electric— was formed to build a hydroelectric generation facility. Manufacturing continued until a few years ago, when the two remaining mills, the West Linn Paper Company and Blue Heron, ceased operations. As of the time of this post, the Willamette Falls Legacy Project is planning to redevelop the site and provide public access to the area, including a river walk. So those condos and waterfront restaurants may not be too far off. In the meantime, Oregon City offers a few different places to view the falls at a distance. 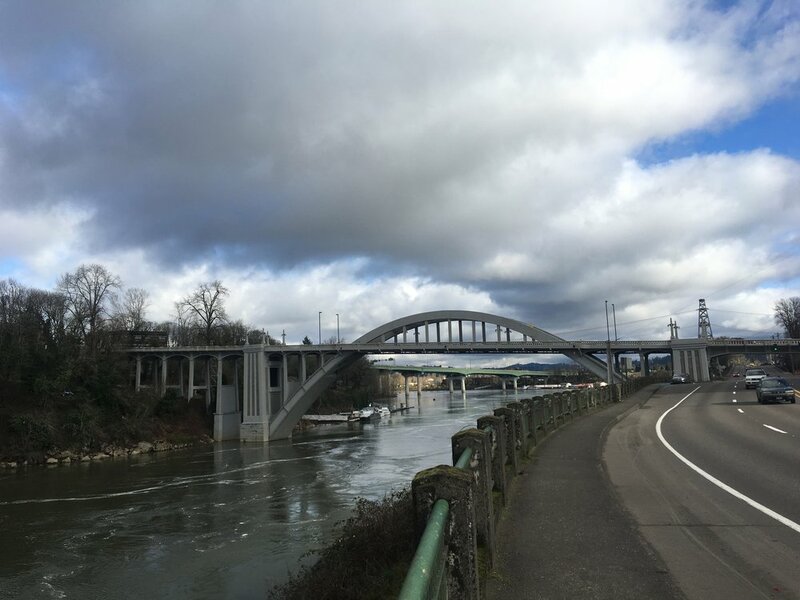 You can see the falls from the Oregon City Bridge, from viewpoints on I-205 and 99E, or you can walk the McLoughlin Promenade, which is our first choice. It’s a pleasant urban hike with paved paths and nice architectural features, including a large waterfall sculpture along some steps. The promenade goes through a small park, where many people stroll with their dogs. It’s a good viewpoint for the falls, and there are some historic homes to see up close. Oregon City actually has the distinction of being the first U.S. city west of the Rocky Mountains to be incorporated. If you’re interested in learning more about its history, the city has several museums, including Museum of the Oregon Territory, the End of the Oregon Trail Interpretive Center, The Stevens Crawford Museum. Otherwise, while you’re there, definitely check out the Oregon City Municipal Elevator. It’s the only municipal elevator in the US and one of four in the world. In 1915, the original water powered elevator was constructed, but that was torn down, and the one you see today was finished in 1955. The flying saucer design of the upper viewing deck is a nod to the start of the space age. The walls are full of lenticular black-and-white photos, showcasing the city’s storied past. The elevator itself has a human operator, which is a bit jarring at first, but the role is a charming relic of the past. And, really, who wouldn’t find that job fun? These days the elevator carries about 800 people per day (1300 in the summer months) between the neighborhoods at the top of the hill and the bottom of the hill. Near the lower entrance of the elevator, on 7th street, you’ll find a store called Coin Corner and Hobbies that’s for sure worth a visit. The shop is a smorgasbord of vintage toys, books, magazines, music, video games, and so much more. Everything is in good condition, tidily displayed, and clean. There are a lot of good deals for collectors, but you can entertain yourself for hours just looking. Downtown as viewed from above. In recent years, downtown Oregon City has undergone a revitalization. It’s small but lively with lots of new shops and restaurants. Black Ink Coffee is reliable for your caffeine fix. The shop serves Stumptown and has a respectable book selection, too. On our last visit, we had a very good Vietnamese lunch at Pho Thi. North of the main downtown stretch, on 14th street, Oregon City Brewing Company and Tony’s Fish Market which are also good options.